This activity comes straight to you from my kidlets preschool! It's an excellent way to build fine motor skills (including the all important pincer grasp) in ages 3-5 years. It might be the sister craft to sewing cards. 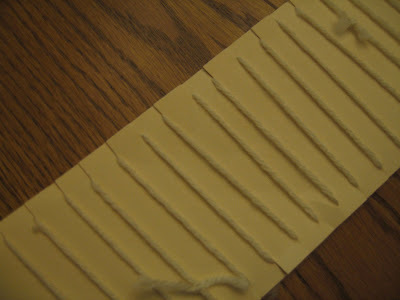 - using the scotch tape, adhere one end of a length of yarn to the top slit. It's not that pretty, but my daughter loved it and was very proud of her accomplishment. my three year old and probably two year old will love this. i have to try it!! Oh I love this one. I'm always looking for new projects that are easy to make! This is perfect! I think I will cute out a gingerbread man and make this his belly! Thanks for the idea. 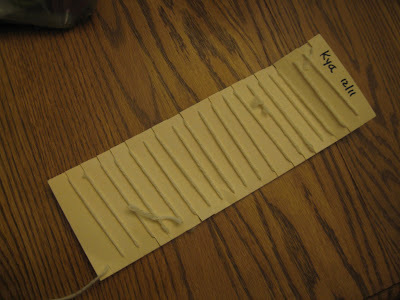 Looks like a great fine motor skill project. We'll have to give it a try. Can't wait to try this with my kiddo. Great idea! I have a 4 year old, this will be perfect! That is a GREAT activity!